Broken gets fixed; shoddy lasts forever. I’ve suffered from RSI since 2003 and have used a variety of keyboards over the years to varying results. I was originally diagnosed with tendonitis in both wrists. Over the next five years my symptoms moved all the way up my arms into my shoulders. Your nerves branch at the shoulder down your arm and your ribcage. On bad days, my nerves were so inflamed I could scratch my elbow and it felt like somebody was touching my side. I’ve since gotten more than 90% better through drastic diet changes, but until I reached that point I tried a lot of keyboards. 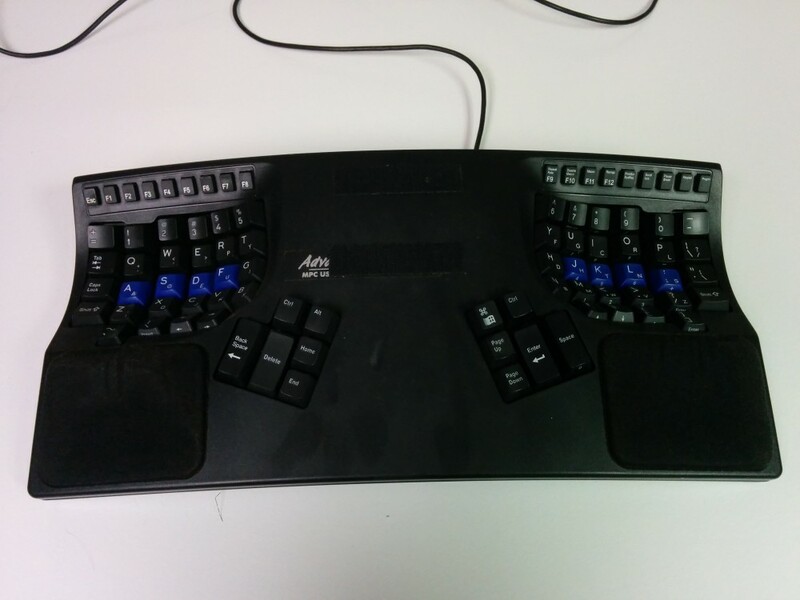 If you have suffered from RSI or just like trying out weird keyboards, read on. Let’s be clear, the Microsoft Natural MultiMedia is trash if you are suffering from serious RSI, but it (or something similar) is what many people start with. It’s about the only “ergonomic” option you can find in brick-and-mortar stores. I got one in college (sometime in the 2004-2005 range) and had good results initially. That is a pattern with many ergonomic devices. It isn’t so much that the device is ergonomic; it’s that you are exercising different tendons/ligaments/muscles around the strain. Different angles and positions stress different ligaments and tendons, so your injuries get some much needed relief. Unfortunately, for many people the underlying cause isn’t being treated and they eventually develop similar problems with the new keyboard. I graduated from college in 2007 and my RSI quickly got worse with a 40 hour work week. The Microsoft Natural MultiMedia just wasn’t cutting it anymore, so I swallowed hard and spent $260 on a Kinesis Advantage Pro. The transition was rough and I was worried I had made a terrible mistake. 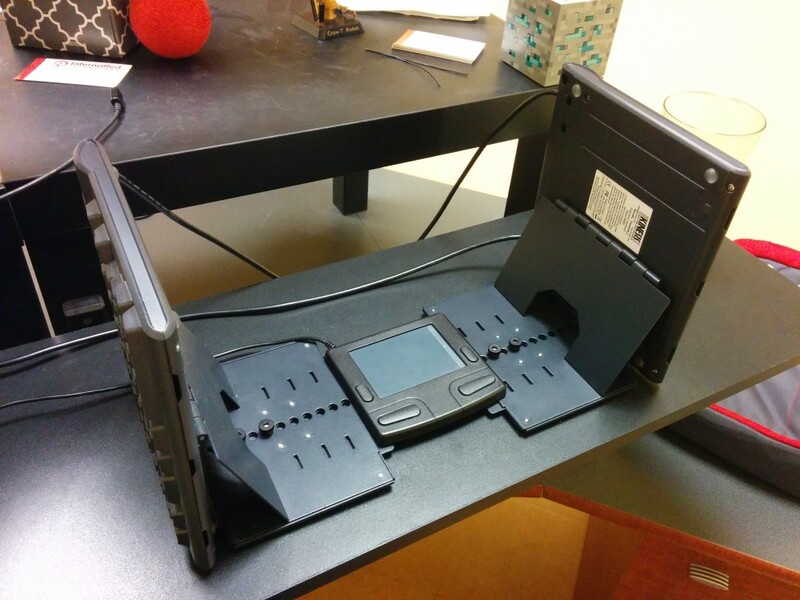 I remember huddling over my desk in more extreme pain than ever after only a couple days of use. I stuck it out though and, after an adjustment period (and a lot of ice), it served me well for years. The layout of the Advantage Pro is amazing. Your thumbs are amazing appendages, but the standard keyboard layout wastes them by only using them for the space bar. The Advantage Pro moves a bunch of commonly used keys to two keypads in the center of the keyboard. This lets you use your thumbs for Backspace, Delete, Super, Alt, Home, End, Page Up, Page Down, and Space. The key wells are spaced far enough apart that your arms can stay naturally at your sides and the keys are stacked vertically instead of staggered. This required some adjustment, but was amazing once I got used to it. The keys are Cherry MX low-force, tactile switches, which feel amazing and helped with the impact of bottoming out. You can also remap keys (useful for programmers who make regular use of symbol keys that are seldom used by the general population), setup macros (something I never got in the habit of using), and there is an optional foot switch that is commonly used for modifier keys (never tried it). At some point (maybe in 2008?) I switched to Dvorak. I’m not sure if this really made any difference, but it was fun. I switched back and forth between QWERTY and Dvorak for a couple of days before fully committing because I was having problems learning by going back and forth. I kept with Dvorak for a couple of years before switching back to QWERTY because I was tired of not being able to type on any other keyboard. It took about two weeks until I could type at a reasonable enough speed to be productive. You could probably adapt faster if you can switch over full time immediately. I switched back and forth for a little while so I could actually get some work done. The Freestyle itself is far inferior to the Advantage Pro, but I can’t use the Advantage vertically. That is the selling point. Otherwise, it’s a pretty average keyboard. But going vertical made it all worth it. Being able to type with your hands still in a neutral handshake position is amazing and I doubt any horizontal keyboard will ever be able to compete with vertical (at least in my case). The Ascent is the vertical mount for the keyboard. It actually can be used at many different angles, but I’ve only used it at the full 90°.It is an extremely well made (and extremely over priced) adjustable steel stand that the Freestyle screws onto. But you don’t actually need it. For the first couple of years I actually used a DIY stand from some scrap wood and attached the keyboard with velcro. I’ve since relented and actually bought the Ascent (it’s much better for travel), but you don’t actually need it. Right now, I’m in a good place and don’t feel a need to switch to anything else. There aren’t that many options for vertical keyboards and there isn’t much interesting innovation elsewhere that I have seen. I don’t expect anyone to run out and try a vertical keyboard, but don’t be afraid to try it if nothing else is working. Or if you just want to be the guy in the office who always gets odd looks and has to explain their setup. TL;DR: The Band SDK is currently very much a preview and you should wait if you want to do anything serious with it. You’re very limited in functionality. I use my Band on a day-to-day basis with my Nexus 5. I had never paired it to a Windows Phone. I had to factory reset my Band to get it to sync with my Lumia 635. I’m hopeful this is not a common issue when switching between platforms. I had no problem getting the band to pair back to my Nexus 5 when I was done. If it is an issue, then cross-platform development would be significantly easier if you had a separate Band for each platform. That may be true anyways to avoid constant re-pairing when testing multiple platforms at once. I was mainly interested in sensor data. My goal was to create a simple app that would post your steps for the day to Slack (I have a lot of Slack code from a Windows Phone Slack client I started and didn’t finish). Ideally, the user would be able to tap a tile on the Band and a message would be sent to Slack. Unfortunately, the SDK does not support anything like that. You can send notifications to a tile, but you can’t trigger code on the phone from a tile. My backup plan was to have a timer background task that read step data from the Band, but that didn’t work either. Apparently, the SDK does not work in background tasks right now . I settled for the user having to tap a button in the app. While I was working on Windows Phone, a co-worker was playing with the SDK on Android using Xamarin. We were disappointed to see that the NuGet package does not support Profile259, which would include iOS and Android. It only supports net45+win+wpa81. Long-term, I hope to see the interfaces separated into a separate assembly so that they can be referenced by the PCL. Otherwise, I would need to wrap almost the entire SDK myself to use it with MVVM. Or hope that Xamarin does it for them with their component. Bluetooth is flaky. You will get IO errors. Be ready for them. I was also surprised that the pedometer sensor gives the total number of steps the device has seen overall, not just for the current day. Since you can’t run in a timer background task right now, there is no reliable way to get just your steps for the day. Be careful managing the lifetime of your IBandClient objects. When it gets disposed, all of your open connections to the Band will be closed. This is perfectly reasonable, but I wasn’t thinking about it at first. If you’re wondering why your ReadingChanged event never fires, this is probably why. AutoMapper is one of those amazing tools that I wish I was better with. It’s incredibly flexible, but I often throw in the towel and map things myself when it starts getting complicated. A recent pain point has been view models in a MvvmCross project. MvvmCross is a nice C# implementation of the MVVM pattern. I use it on a daily basis to write mobile apps. It’s very common to use it with AutoMapper to map from Model -> View Model. However, my view models often have constructor dependencies, which AutoMapper can’t handle with the default configuration. MvvmCross is able to supply these dependencies. We just need to make sure everything is registered and tell AutoMapper how to get them. My demo is a simple app that displays different types of tiles. You can see that TileViewModel has a dependency on ITileService. Because of this, AutoMapper can’t instantiate a TileViewModel. We need to let AutoMapper know how to supply this dependency, which we can do through configuration. The default App.cs for MvvmCross already registers all interfaces that end with “Service”, so we just need to register the view model. And the magic is complete. Now, we can use AutoMapper as usual. Real Life Sciences (RLS) failed for many reasons. The tech team consisted of me and one of the co-founders. (And for the first few months it was just me.) The tool we built was functional, but not spectacular. We used a lot of tech we weren’t familiar with, which slowed progress. The team was distributed across four cities, and none of us had experience working remotely. Consequently, communication was poor. The only funding came from a family member of one of the co-founders. But I think the biggest reason for failure was risk imbalance among the founders (and me). I was initially brought in as a full-time consultant to build the first version of the product. At this point, the four co-founders were all working part-time in various capacities. After a few months, the technical co-founder lost her day job when that startup went under and she shifted over full-time to RLS. Two other founders were working on finding funding and the fourth founder did… something. I never was quite sure what he did. The technical co-founder was working with me full-time building the product. The two business/sales co-founders were working with our alpha customer and trying to secure funding, but only part-time. The fourth co-founder was doing… something. We were now in a situation where the people responsible for securing funding had little to no risk compared to the technical people. Both of them had good jobs and no incentive to quit them. It’s unclear what level of success would have even been required to bring them in full-time. I’m not blameless either. I enabled the situation by continuing to work for equity after the money ran out. It doesn’t matter how much of the pie you own when there is no pie. I know it is almost impossible to be part of a startup where all co-founders take on an equal risk. There are too many circumstances outside of work for that to be possible, but don’t make the same mistakes I made. If you see a situation where the risk is extremely lopsided, bring it up. And if nothing changes, look for your exit. Note: I started this post in October 2012 after quitting my previous job at the end of February 2012. I never posted it, but feel it is appropriate now that the company exists in name only. I’ve made slight changes, but most of the post exists as I originally wrote it. I haven’t been paid since August. The only co-worker I see on a daily basis is my cat, who always thinks it’s her turn with the keyboard. I would love to have a week of physical interaction with the rest of my team. And even with all of that, my new job is still awesome. I’m not a quitter by nature, but in February I actually did it. I quit. I had been trying to make it work. I really was. Eventually though, I had to accept that sometimes a job just isn’t right for you. The tech may not be interesting. Maybe the pay is mediocre. Possibly your main project has no direction. And sometimes all of these converge into one… what? I mean, it’s not terrible. You can live with it. After all, they are giving you money to write code, right? And your co-workers are all really nice. But what if you don’t need the money? Or you spend a good chunk of your time wondering why you came to work today? Or every time you look something up on StackOverflow you get distracted by the Careers 2.0 postings along the right side. That’s where I found myself this winter, so I quit. I wrote an email on a Friday, slept on it over the weekend, and then sent it first thing on Monday morning. By mid-morning, I knew that I was going to be unemployed in two days. I had no plan, just the usual “exploring opportunities” and “researching startup ideas”. But I didn’t need the money and I felt amazing. The happiest I had been about my career in awhile. And then everything just fell into place. Former co-workers and classmates heard I was available and within days I had multiple options. I decided to work remotely for a former classmate’s startup. And when the money ran out I just kept working. I get to work with an up to date stack on a greenfield project (the first true greenfield of my career). I get serious input into the architecture. I get the freedom to work whatever hours I want, from wherever I want. And, right now, I don’t get paid. Sometimes though, it pays to be a quitter. It’s now May 2014. That startup never did get any more funding. I continued to work on it intermittently, but cut my hours back significantly. I got a lot of equity thrown at me, but even 100% of zero is still zero. Amusingly, I was so underpaid before, that even though I didn’t get paid for the last five months of work, I still made almost as much as I had the previous year. I was already having doubts that funding was coming around the time I wrote this post, but I didn’t have anything else on the table at the time, so I stuck with it. I need to collect my thoughts, but for now I’ll just say that you should avoid a startup where there is an extreme risk imbalance among the founders. The short recap of where I’ve been for the past 2 years. On February 29, 2012, I quit my job at Summersault working on Adopt-a-pet.com. I was struggling with RSI and the work wasn’t fulfilling. The backend was a mess and the project had no direction. I had butted heads with other developers over some issues repeatedly and no progress was being made. My plan was to take some time off to rest my arms and look at some startup ideas. That plan literally lasted one day. On March 1 an old college friend contacted me asking if I wanted to come work at her new startup. Over the next 6 months we made progress, but funding dried up and the product died in a private beta. Professionally, the best things to come out of it were that I got to say I was a professional Ruby developer and that I had experience working remote. The real purpose of this post was to get back into the swing of writing and publishing. Over the past couple of years I have started writing several posts, but never finished. I’m a creature of habit, and if I don’t include writing in my regular routine, it just doesn’t happen. Hopefully this is a new start. I had the good fortune of attending my first CodeMash a couple of weeks ago. CodeMash is a conference in Sandusky, OH in the middle of winter at an indoor waterpark/convention center. All 1200 tickets were sold out in 20 minutes and the registration rush brought EventBrite’s servers to their knees. There weren’t any Perl talks (maybe I’ll submit one next year), but there was a wide range of topics to choose from. Carl Quinn from Netflix gave an excellent talk on how Netflix uses Amazon Web Services. They have a really slick setup where a deployment involves simply firing up a new, pre-baked instance and redirecting traffic to it through the load balancer. The new version runs alongside the old version and a rollback simply involves telling the load balancer to send all traffic back to the old version. By pre-baking images they avoid having to do any scripting on the instance as part of deployment. Pretty slick. And their so redundant with their Cassandra instances, they put them on ephemeral storage, which means that the data disappears if the instance is shutdown. I only caught the second half of Nick Quaranto’s talk on building ruby gems, but what I did see was a good outline of best practices for creating and managing your own gems. I was also interested to learn of GemTesters, which is basically CPAN Testers for Ruby. I often hear Perl mongers mention that no other community has something like CPAN Testers and that makes Perl better. Well, Ruby has it. I was really looking forward to this talk by Colin Gemmell and wasn’t disappointed. Colin went over the basics of knife, roles, recipes, and cookbooks, while making it all seem so easy. I’ve even started playing around with Chef at work already and am hoping to automate a good chunk of our infrastructure management with it. Nothing like a developer pretending to be a sysadmin. I think we call that devops now. I had the misfortune of fumbling around with jQTouch this summer, so I was looking forward to hearing about how the 1.0 release of jQuery Mobile was working out. Apparently a lot has changed since the summer and it is now on a path to becoming the dominant browser-based mobile framework. It’s even got Visual Studio 2010 and Dreamweaver CS5 integration, which indicates some serious momentum to me. I’m hoping to get the opportunity to play around with this some more on a side project. Scott Hanselman is one of the best speakers you will ever see at a tech conference and this talk did not disappoint. He went over how to deal with information overload. Scott gets hundreds of emails a day and can never hope to give everybody the slice of his time that they wish they could have. Dealing with this has led to him developing a number of techniques for coping. For example, he splits his inbox by whether the message was sent to him or he was just CC’d. If you CC him on an email, he may never read it. If it was important you would have sent it to him. The talk was a blend of many time management and organization techniques and I highly encourage you to check it out once it’s up on InfoQ within the next few months. Backbone.js and CoffeeScript are two tools that I’ve been interested in, but have not had the motivation to actually check out. I’ve been through the quagmire of trying to understand jQuery eventing gone wild. And I’ve been the one writing the code. At some point ad-hoc event handlers just gets to be too much to manage and that is where a tool like Backbone.js comes in handy. Backbone.js is just a client-side MVC framework. That’s it. And coupled with the expressiveness of CoffeeScript you can get a lot done with just a little bit of code. I see myself using this judiciously in the future. For many sites it would be overkill, but even those sites often have certain pages which are more JS-heavy than others. It was a great conference. Many attendees consider CodeMash to be the best conference they attend every year. I was just about the only Perl guy there, but it was great being immersed with developers with a wide variety of skills. And it’s very satisfying to play in a waterpark in January while it snows outside.